Still Life, Still There . . . I have for some time been mulling over how to describe my personal relationship with urban nature. An encounter with a wildflower I enjoyed this week gave me an idea, a way to put that concept into words. The beginning of most interactions with the natural world takes place during the survey phase when species, or phenomena, or processes, are observed, listed, and described. Wildflowers provide a rich source of such raw material. At first, each species is new. The time of year, their environment, their physical features, are all engaging and educational. After two full growing seasons, which cover both annual and perennial plants, this first push of the project comes to a close. Personally, I have kept my eyes on the West Village, stuck to the geographic boundaries I set at the beginning, and have listed most, although not all of what I have noted (I have left out a few species as of this writing for want of better photographs and future content). I have been able to profile a variety of flowering plants, close to four dozen species, answering to some degree the “What is out there?” and “When is it out there?” questions. “What’s next?” now begs to be asked. The answer came to me as I was hurrying through a cold rain earlier in the week. I had slogged through Washington Square, faced into a stiff wind up 5th Avenue. My pant legs were soaked, my umbrella bending, so I turned down West 11th Street toward my neighborhood. I crossed the Avenue of the Americas and started down the block protected on the north side by the tall buildings of the former St. Vincent’s Hospital complex. The sudden lull in the wind felt like being within the eye of a hurricane. I could slow down, relax, so I did so. As I strolled, I passed the front gardens of the red brick Federal town houses lining each side of the street. One of these, somewhat unkempt, nonetheless held a surprise: a patch of White Snakeroot (Ageratina altissima) still in full bloom. The plant’s umbels, like little balls of white yarn, poked their flower heads between the black iron bars of a fence, creating a lovely urban wildflower still life. As of December 10, 2011, New York City has yet to experience an overnight freeze. This is one of the latest on record. The colorful lining of this meteorological oddity has been an extended autumn with the tree leaves, late-season wildflowers, and hardy weeds still in bloom. 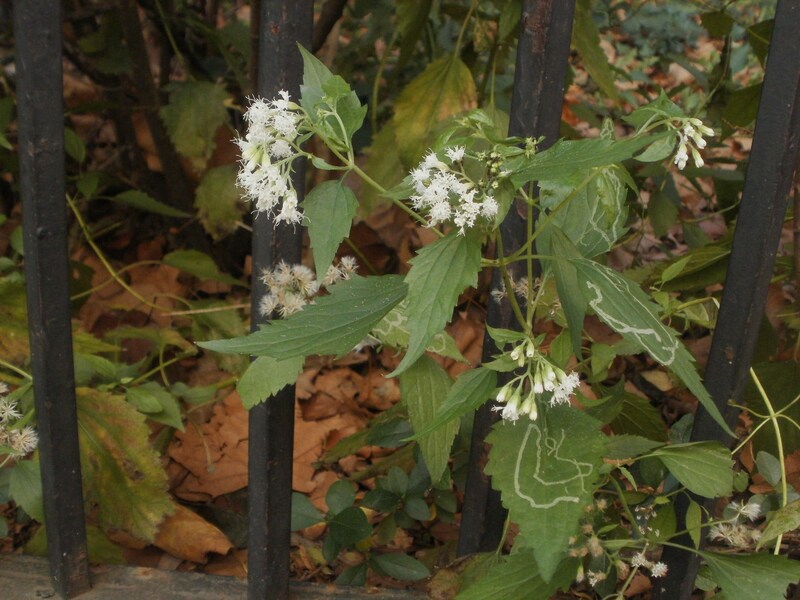 I profiled White Snakeroot in October of 2010. The plants I photographed for the essay were located in the same spot as the one’s I saw glistening in the rain. These flowers, then, were their progeny. The words arrived for my revelation. The answer to “What’s next?” lies within the relationship a person can cultivate with the urban outdoors. Seeing that patch of White Snakeroot felt like greeting an old friend, the one who because of conflicting schedules or long distance you can visit only once in a year, perhaps during a specific holiday. Other examples of West Village wildflower companions came to me, but this particular one really pulled the concept from my personal rumination section and into full public expression. 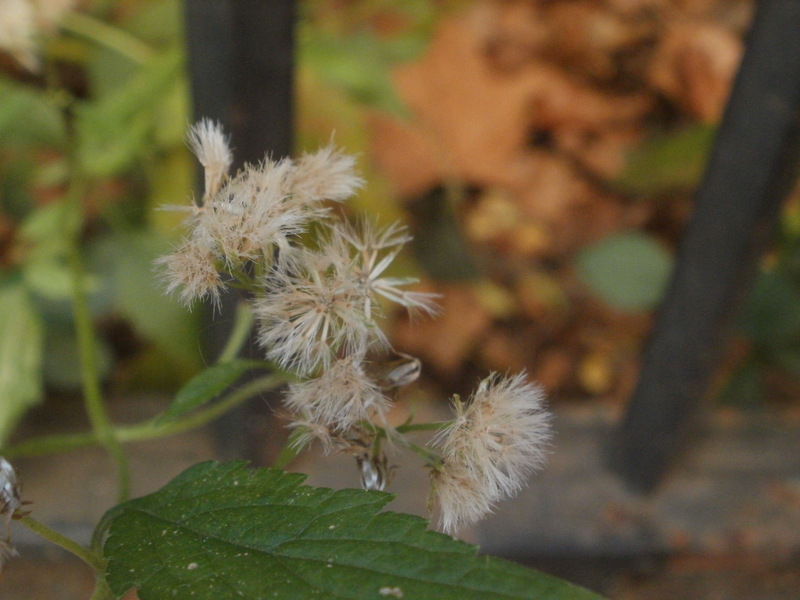 So, if you see a bearded and bookish grown man pausing to greet a weed, he may be me, visiting one of my friends, one of the wildflowers of the West Village.